If you are on a floodplain you can expect to be flooded. 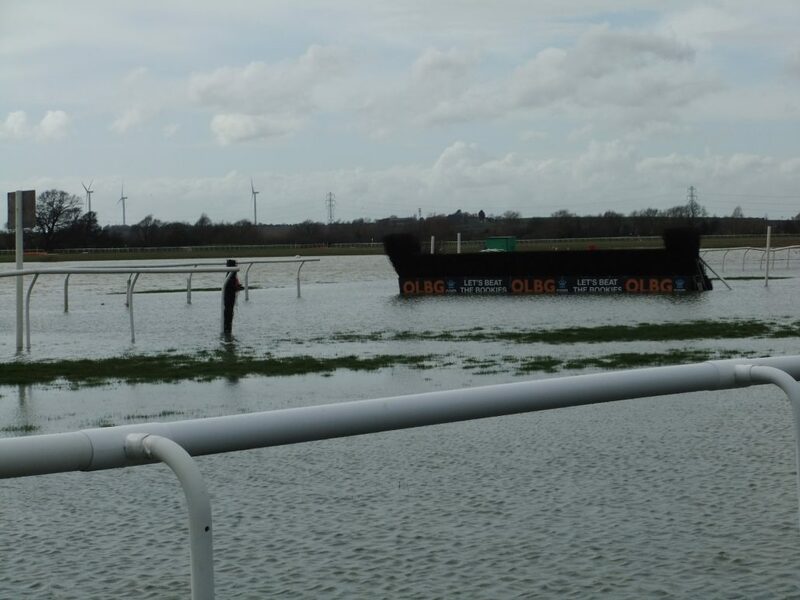 Huntingdon racecourse is on a floodplain, and last weekend it was flooded, depriving the course of its Family Fun day fixture and a crowd likely to be upwards of 4,000 people. I had driven past the track on Tuesday, at which time it was all under water, and Noah could have moored his ark right by the grandstand. This morning I went to meet Sam Butler Spelzini, Head Groundsman, to find out what he and his team would have to do to have the course ready for the next meeting on 24 April. I was astounded when I arrived to see plenty of green grass, as almost all the water had drained away as quickly as it had appeared. Sam went through the timeline of recent days that led up to the abandonment of Monday's meeting before talking through the remedial work necessary to repair the damage to the course. The first indication that rain was on its way came in a flood alert for Kings Lynn and the fens at around 1030 on Friday night (30 March). Early the following morning it arrived, and 13 mm over the course of the day was enough so that, in the words of the old Sunday School chorus, "The rains came down and the floods came up." You could almost see the water rolling across the track. Indeed, when there was torrential rain at the conclusion of a previous meeting Sam had to give a real hurry up to the burger vans to move or risk being marooned. One of the contributory factors to flooding is the network of culverts and streams that surround the course. They are something of a double edged sword, for whilst they help enormously with quick drainage, when there is more water in them than they can cope with, the only way is up. Three of them converge at one point, so it's like three lanes of motorway traffic merging into one, with neither the cars nor the water able to continue at their original speed. Result - blockage followed by overspill. Huntingdon is regularly described as a flat track, and so it is, though not totally. Most times when there is waterlogging, around half the circuit will be submerged, roughly from the chute at the end of the home straight to the end of the back straight, following the line of a brook running diagonally across the infield. Last weekend you could add to that most of the home straight, the area of picnic tables in front of the stands, and the whole area behind the stands, including the paddock. All of this area was in a good foot of water, and in parts of the course it was more than two feet deep. A final area that became flooded was the stable block. This has room for 100 horses, and by Friday evening all units were kitted out with bedding ready for Monday's meeting. The first job on Saturday morning was to lift as much of this bedding as possible; clearly if it became waterlogged it would just have to be thrown way. It was the flood water reaching this far that prompted one of the groundstaff team to remark that he had never seen conditions so bad in his 12 years working there. There was nothing the team could do until the water receded, which it began to do on Tuesday. The further rain forecast for that day thankfully didn't materialise. This morning almost all the water had drained away they and the team was out on the track to begin the clear up. The first job is hand raking through the turf to collect all the debris that's been left behind. Mostly this is reeds and straw, but amongst the other items to have been deposited are some pieces of plastic running rail and an old railway sleeper. Once that job is done, the task of getting the turf back into racing condition can begin. There are two activities here. First Sam will verti-drain the course to help further with the drainage, and also to aerate the soil. Think putting your garden fork in the ground and wiggling it back and forth. Thankfully Sam's machine fits on the back of a tractor. I wondered what damage the soaking might have done to the fences and hurdles, and was a little surprised to find they should all be fine. Of course the core of the fences is hard wood, and the birch for the hurdles is another natural substance. The most vulnerable part of the obstacles is the kick board on the take off side of the fences. The flooding has dislodged many of the divots brought up from racing during the season. 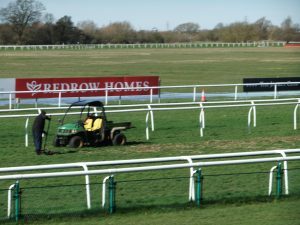 Replacing these with a mix of topsoil, compost and seed, followed by a levelling of the surface will bring the racetrack up to fitness, but not the public or stable areas. 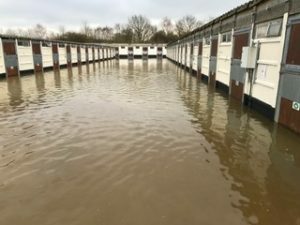 Rightly, the British Horseracing Authority has rigorous requirements for the welfare of horses, and there's work to be done in the stable block following the flood to ensure those standards are met. In total, 95 of the stable units were under a foot or so of water. Now they are clear of any bedding that couldn't be removed earlier. Next they will all be pressure hosed down and disinfected, before another wash down. Finally, after time to dry out, they can be kitted out with fresh bedding ready for he next equine visitors. On Tuesday afternoon the BHA offered an extra fixture to Huntingdon, to take place this coming Saturday. After deliberation, the course turned down the opportunity, feeling they would not be quite ready. It's taking place at Fakenham instead. If it were scheduled for Sunday, Sam reckons they might have gone for it, and next Monday they would jump at the chance. What a busy few days, all the more so when you realise that in the week before a meeting on 30 March last year the course was dry and the team were watering the track. Oh, the vagaries of the British weather.